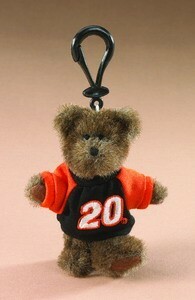 Officially licensed, fully jointed Matt Kenseth #20 Boyds Bear key ring with authentic NASCAR embroidered sweatshirt. Actual size 4" tall. The picture shown is incorrect, the actual Bear has a sweatshirt with White sleeves.